Fareed hears from Wall Street Journal columnist Bret Stephens and Council on Foreign Relations President Richard Haass about the latest flare-up in violence between Israel and the Palestinians. Bret Stephens, The Wall Street Journal has an editorial that says the only solution here is to completely destroy Hamas, and The Journal advocates a land campaign, Israel to go back into Gaza with troops, which would inevitably mean there would be some kind of temporary occupation of Gaza. Stephens: Well, not a full occupation of the Gaza Strip. But what I do think is right is that Israel has to occupy the territory that separates Gaza from Egypt, because what we've found now is that Hamas is firing much more sophisticated rockets into Israel, with ranges that are extending beyond Tel Aviv, up to Jerusalem, and Haifa. And that's unacceptable for any state to deal with that, whether these missiles are accurate and hitting their targets or not. And the problem you have had is that this is now the third time Israel has gone to war since it withdrew all of its settlements and all of it settlers from the Gaza Strip in 2005. You have this pattern of recurring violence. I don't think, in the long run, that's a smart and acceptable strategy, to allow Hamas to remain in Gaza with a power base. Obviously, you can't eradicate it entirely, but you can eradicate it as an effective fighting force and as a political entity. And, by the way, one of the beneficiaries of that kind of action would be Fatah, would be Mahmoud Abbas, because what I think Hamas is trying to do, I think the strategy here is to gain the upper hand in intra-Palestinian politics by attempting to start a third intifada. Is it a smart strategy to start a land campaign? It would cause a lot of international consternation, to say the least. Haass: You can do some things militarily against Hamas, but there's no way you can destroy it, either politically or militarily. 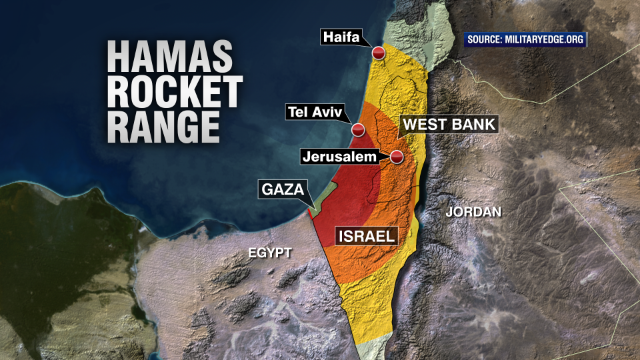 Hamas is sitting on 10,000 to 12,000 rockets that can now reach more and more inside Israel. So just say you get rid of 25 percent. That still leaves 8,000 or 9,000 missiles. You can't destroy them militarily. Politically, that would probably strengthen Hamas. They would then be up there saying “we're the real source of resistance”. What you've got to do more than anything else, I think, is think about how do you weaken them? The only way I know of weakening them is to strengthen Fatah. And that's the opportunity of reaching out. If Netanyahu wants to do something, I would say put out some big ideas on the table. Give something for Mahmoud Abbas and Fatah to work with. Split Hamas away, break the coalition between Hamas and Fatah and basically say, only these people can deliver, you, Hamas, can only bring misery down on the Palestinian people. So be tough with them, but put forward a serious diplomatic alternative. That’s the only hope. I wish there was a Palestinian voice on this matter. Brett Stephens in the old Jerusalem Post editor (he moved from one Murdoch property to another when came to the WSJ), and represents right wing Israelis. Haas is an American foreign policy centrist. Shouldn't Palestianian analysists be part of this conversation? Why don't you invite Rami Khoury? Correct. It seems like this is a forum asking people how to manage their colony. Indeed Bret Stephens is a hawk! How realistic is he to eradicate Hamas? Richard Haass is more down to earth and opts for a political solution. all jewish children must boil in the flames of a oven soon all jews are going to be reduced to ashes. sandstorm- you maggot, your time is coming soon. and yet if you were saying that about Muslims or Christians there would be a huge outrage on the postings. Keep dreaming evil soul. They tried it for generations, we the Jews, are the ultimate survivors. Brilliant. That will really help. You are the problem not the solution. People like you are why people are growing extremely tired of fanatical Islam and will increasingly despise it, ignore it and, if need be, destroy it. NO child should boil in flames only greedy, hateful warmongering b@5t@rd5 like yourself should boil!!!! NO CHILD is exactly that @ CHOSEN!!!! I dont think i could be any more consise about that. Yes, the horrible sophisticated Hamas rockets that have failed to cause a dent in the iron dome. Just another political one sided view aimed at creating fear and in turn, allow the Israelis to continue with their air strikes with impunity. What will Israel achieve with air strikes? Will it somehow put an end to the leadership of Hamas by bombing targets in heavily populated areas? When has that worked? This pattern will never end with Israel and Hamas. They'll continue this course with no end in sight. Hamas was democratically elected by the Palestinian people, so if Israel is genuinely sincere in a 2 state solution they would respect the Hamas party that was elected. But they're unwilling to do so which is what make this whole situation so difficult. I think by now, there are many Israelis who want a 2 state solution, but the Israeli government prefers to play with Pandora's box and start war instead. Why? In a time of war, the government has unwavering support from it's people. This is how they stay in power. Bibi knows that if there's this perpetual war with the Palestinians, he will have this unwavering support. A 2 state solution is the only way to achieve piece. The leaders on both sides must embrace that and stop turning to machines of war. Especially the leadership in Israel, since they have most of the playing cards. This war will not end until an overall settlement is reached, that settlement includes Israeli withdrawal of all occupied territory of Palestinian land since the war in 1967 (yes, this war isn't a a year old or for that matter a decade old, it's been going on for almost 50 years). The release of thousands of prisoners(Palestinian and Lebanese) in Israel, and a STATE for Palestinians in their OWN country which had been illegally occupied by the Israeli settlers. No justice, No Peace. This war will not end anytime soon unless the ignorant people realize the apartheid state of Israel and the crystal clear (crystal clear for any reasoning and logical person) oppression against the Palestinians. IS THIS A WAR OR INTERNATIONAL GENOCIDE ON PALESTINE? Let check it out and decide yourself. Israel was fully secured from any weapons from her enemies by the USA and the west at no cost to Israel. The proof is the iron dome provided by the USA to protect Israel from any enemy attack from sky. More over all military hardware and supplies are being provided at no cost to Israel. Israel's economy is booming, because all the Western nations have extended free trade, free patents, and first preference economical advantages to Israel.Further more, Israel has been given iron clad political guarantee by the West and the USA to ignore and reject all the U. N. Security Council Resolutions and international pacts, human rights laws if passed against Israel. On the other hand, Palestinians have been bared from having freedom, human rights, rights to have free trade, water and energy rights and basic security. The 5 million human beings are kept in a cage like environment and being feed by the West and Arab countries at their wills. For the inhumane conditions of these occupied people, who should be blamed? Not only Israel but basically the West including America and Americans too, who bragged that they are the most humane, compassionate, just, fair and peace loving civilized people on this globe. Hamas fired on Israel first. Israel is defending her citizens and territory. It is Hamas that would like a genocide on Jews- it says so in their charter.Israel gave gaza to the palestinan, uprooted all settlements, gave them the keys to money making enterprises. What Israel got in return was instead of Singapore on the med, is unchecked hostility. It is the leaders of Hamas that are perpetrating a genocide on their own people. Hiding rockets behind women & children. Palestinians have the same chance if not more aid from the west if they will only live their life within the confines of nonviolent behaviour. However they choose to spend their capital on rockets. How sad they have to wait to be treated by Israeli dr.'s. The "inhumane" conditions are solely because hamas does not accept Israel. How about the financing of the PA/hamas unity gov't why should we fund what we the USA have declared are terrorists? How little you know and portent to know a lot.... have you ever had to run for your life to hide in a bomb shelter? Let me guess- no. I had to do it today. It wasn't a fun experience. There were pregnant women, woman with 4 little children there too. Egypt offered a cease fire today. which was accepted by all Arab nations ,as well as,the US and EU. What did Hamas do? Rejected it. Why? Because they live off the misery of their people. They use their people as human shield to go on the roof of buildings , to hide their rockets in schools, day care centers, hospitals and private homes. Israel gave back Gaza Strip to the Palestinians hoping that all the violence will finally stop, but their only agenda is to kill, nothing else. How should Israel respond to Hamas? This question is wrong question. Israel must leave the occupied Palestine lands, that's all, problem solved. Interesting. Maybe they should rebuild the settlements in Gaza to improve the accuracy of these rockets. I have a better idea. Israel should give Gaza Strip back to Egypt where it was originally part of, and let President Sisi deal with them. Believe me, Hamas would prefer Israel occupation over Egypt rule. They would crush them as they did to the Muslim Brotherhood., and the world would be quite about it, just as they are quite about Syria. Lol. So your telling me that the Palestinian's have it Great under the current Isreali occupation? NO! Your government needs to Stop building settlements, bulldoze the settlements that were built which everyone knows are illegal under international law and come to the negotiation table committed to drawing up a fair solution. WHO is evil @ Pakistan for Palestine??? And i agree @ Ferhat and @ John2397! And the US needs to STOP financing Israel. All we are doing is enabling them much like parents do to drug using kids! Gotta cut the apron strings! Killing children is EVIL! Just stating the facts, So accept it and move on. Shame on you Fareed Zakaria to ask this question, and why are you asking what the oppressor should do? Question should be when is Israel going to stop its terrorist activities. And lets stop paying our hard earned money to israel. All the Hamas losers must be exterminated. Kill those losers who are hurting the palistinian cause. Hamas will be crushed into ashes.!! Hamas are delusional, digging their own graves. Hope they are all killed and the PLO take over. @ SF2OAK, I dont believe we should fund ANY of them! And ive said that more times than i can count and have never said differently!!!! Humanitarian aid ONLY to foreign countries! I agree with YOU @ Pakistan for Palestine...calm down. I dont think you read my posts correctly. And i said that very thing myself previously! Israel is not going away, unless the USA either abdicates its military power or becomes energy independent. We put the Zionists there to keep Arabs separated. It wasn't for the chosen people, it was for the USA. Of course, I agree that killing children (and adults) is sad, but that's the way war works. Is your house warm in February? Israel does not believe that Fatah can deliver against Hamas. Therefore, Israel DOES NOT want to weaken Hamas – it wants it to control that territory (which is why you're not really seeing a strong response from Israel with many hundreds of deaths like in Cast Lead). Sadly, Hamas is the only organization that both wants to rule Gaza, and has the power (i.e. the iron fist) necessary to rule Gaza. Terrorism and the war between Israel and Hamas and the rest of the Middle East, has been old news for the last twenty years dating back to the war of Lebanon and Israel during the sixties or seventies and we as citizens of the world have learned nothing from then or now about how to deal with the Middle East and the Gaza conflict in recent years. Should we as a global society punish a nation like Israel who are trying to solve, the Hamas terrorism problem in Gaza with diplomatic and military solutions and sometimes innocent people do get hurt and killed, but it is nothing to do with Israel but with the government of Gaza and who fail to help it's citizens in times of crises. As an American who has traveled to many great city's in Israel and different parts of the Middle East, and have listened to both sides of the issues from the young Jewish men and women who are college and university educated also the young Arabs both party's tell me that the only way to solve the Gaza and Middle East conflict is to get rid or Hamas and other terrorism groups that ruin peoples lives everyday of the year and replace with a government that listens to the people voices and respects its citizens in both Israel and Gaza. As Americans we as a nation we should not punish Israel in terms or restricting flight's to Israel and economic trade between our two great country's, but we should listen to the issues form both sides and a as American's do what we have always done for many years be a diplomatic bridge of peace from using our military support and diplomatic teams to help Israel rebuild trust between their neighbors in Gaza and the Middle East for years to come.